2018 Ford Tranist For Sale In Vernon, Kelowna, Okanagan, BC. Meeting the needs and requirements of your business, the 2018 Ford Transit offers the choice of three wheelbases, three lengths, three roof heights, three engines, cargo van or passenger wagon, and an array of fitting options. Find what you’re looking for with three trim levels: XLT Passenger Wagon, Cargo Van, and XL Passenger Wagon. With ten bold exterior colour choices, you can represent your business’s style with the 2018 Ford Transit. Pick from shades like Oxford White, Stone Grey and Shadow black; or vibrant hues such as School Bus Yellow, Race Red and Green Gem. Choose between 3 wheelbase sizes: 130-inch, 148-inch, and 148-inch extended length. Choose between 3 roof heights: Low Roof with the height of 83-inches; Medium Roof with the height of 100-inches; and High Roof with the height of 109.4-inches (extended length) or 110.1-inches. Cargo and cabin versatility is maximized with various door configurations, which include: 50/50 rear hinged with a 180-degree opening, 50/50 hinged rear, 237-degree opening, 60/40 hinged passenger-side, 60-40 hinged passenger-side cargo door, sliding passenger-side, or sliding driver-side and passenger-side. A strong black grille with black surround adds a sporty touch, while available chrome grille with chrome surround adds a hint of refinement. 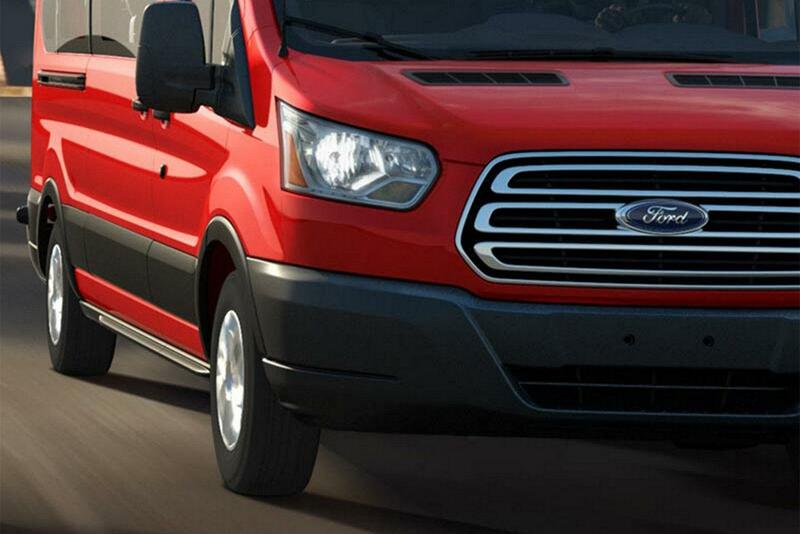 Either way, the Transit's grille design lets you know this was Built Ford Tough. The lighting scheme features the available halogen headlights with chrome trim and AutoLight with Rain Sensing Wipers. Load passengers and cargo with ease with various running board options, including sliding passenger side cargo-door only, power sliding passenger side cargo-door only, or extended length (driver 1st row, passenger 1st and 2nd row). 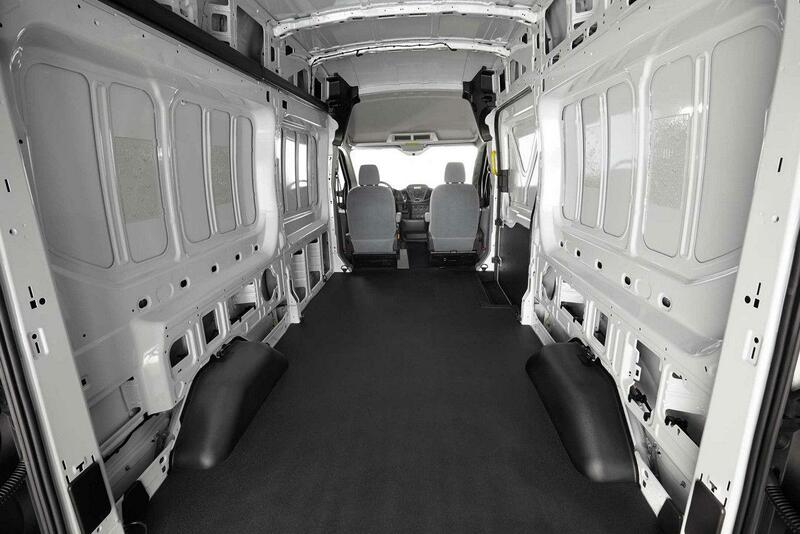 Various window combinations allow you to customize the Transit perfectly. Designed with lightweight unibody construction, the front, rear and side rails are welded to the floor pan, cross members and torque boxes. You know the 2018 Ford Transit was Built Ford Tough, withstanding extreme temperature testing, rigorous durability and strength testing. Meanwhile, inside the cabin of the 2018 Ford Transit lies all the amenities you need to keep you and your crew comfortable, including air conditioning. The cabin was designed for the modern worker, influenced by Ford's energy-in-motion kinetic design. An adjustable driver's seat and a tilt/telescopic steering wheel ensure you're comfortable behind the wheel. Meanwhile, ergonomically placed gauges and controls are easy to reach and read. Versatility is optimized with a large amount of storage space. Ford's Upfitter Switches is an easy to use add-on system, available with the 2018 Ford Transit. Up to four circuits can operate high-power relays for heavy-duty accessories, which are all integrated into the instrument gauges to access and read quickly. Available Lane-Keeping Alert works with a camera mounted behind the windshield which watches the road lane markings to properly determine surroundings to detect any lane departure. The available SYNC3 with Apple CarPlay and Android Auto offers voice-activated controls, a 6.5-inch LCD capacitive touchscreen with easy-to-use interface keeps you connected and in control. Ford of Canada offers Ford Genuine Parts and Ford Genuine Accessories for the 2018 Ford Transit. 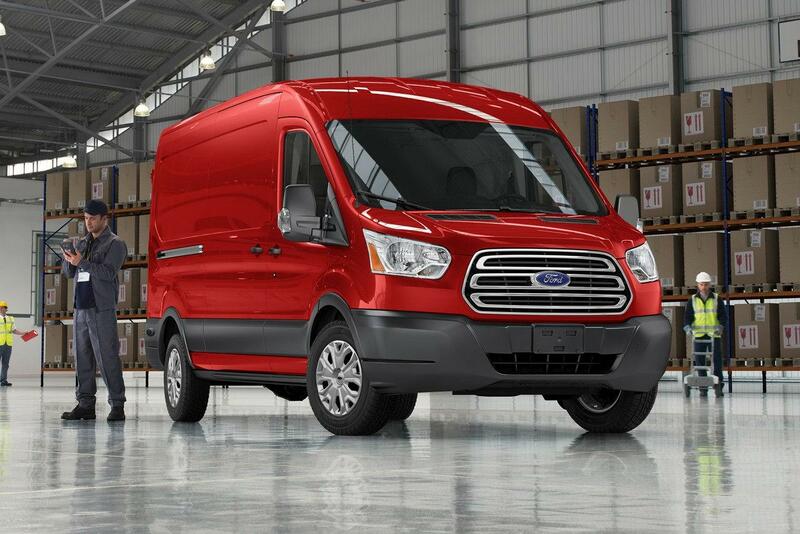 With Genuine Ford Accessories, you can customize your Ford Transit to suit every one of your commercial needs. Exterior accessories span from trailer and towing components to racks and carriers. Meanwhile, interior accessories range from cargo organization to floor mats and seat covers. Never worry about being stranded again with the available battery guard. Take things to the next level with a wide range of available electronic and audio accessories. When it comes to ensuring that your commercial performance needs are met, look no further than the 2018 Ford Transit. It offers a maximum towing capability of 7,500 lbs (3,401 kg), with convenient towing features such as Trailer Brake Controller for seamless braking with a trailer. The Transit Cargo Van offers a GVWR range from 8,600 lbs (SRW) to 10,360 lbs (DRW), while payloads range from 3,680 to 4,650 lbs. For a vehicle designed around your every commercial need, it’s no wonder the 2018 Ford Transit is backed by an award-winning legacy. Designed around your business, the 2018 Ford Transit is also incredibly safe. Find the perfect companion to your business with the 2018 Ford Transit. Upfitter friendly with loads of available Ford Genuine Accessories, you can customize the Transit to suit your every need. Visit your local Vernon Ford Dealer - Watkin Motors Ford and find out why the 2018 Ford Transit is the perfect addition to your business. Shop the wide range of commercial vehicles at Watkin Motors Ford, including new and pre-owned Ford models. When it comes to your business, you only want to drive it if it was built Ford tough.